Welcome to my summary of October’s Staging Diva Dispatch articles. It’s my 53rd birthday this month and I’m continuing to adjust to my new life as an empty-nester. That’s why I’ve been writing about how to stop procrastinating and get more done. It’s been on my mind a lot as I question how I want to move forward and develop new goals and plans. In this month’s articles you’ll see a great example of how to stage a master bedroom, discover a crazy revelation I had that totally changes how I choose what ideas to pursue, have a chance to sign up for a no-cost teleseminar with me and meet 9 inspiring home stagers. That cold nip in the air is reminding me that the holiday season is almost upon us and with it the end of this year’s busy home staging season. Did you accomplish everything you wanted to in 2012 as a home stager? Whether you’re a new or established home stager (or you’re only in the early planning stages), I want you to be the first to know about my Big Birthday Sale starting today. You’ll find significant savings on a whole range of products and services to take your staging career to a whole new level. I’ve learned a lot the hard way on my journey as an entrepreneur since 1998 and home stager since 2002. This means I can cut a ton of corners for you. So if you’re feeling life is short and there’s no time to waste, I hope you’ll take the opportunity to get the training or coaching needed to follow my success blueprint. You’ll save time, energy and frustration when you know how to turn your creative talents into a profitable staging and redesign business. I hope you enjoy this month’s Staging Diva Dispatch. 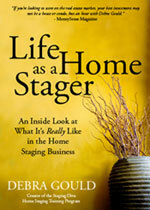 Click here to read all the home staging business articles. Happy Fall (or Spring for my Australian readers)! P.S. October is Breast Cancer Awareness Month. I wrote Heroes of Home Staging with ways to support research and saluting home stagers who have battled their way back from this terrible disease.